San Pedro, the legendary cactus of vision, has been used by the shamans of Peru for at least 3,500 years. Referring to St. Peter, who holds the keys to Heaven, its name is suggestive of the plant's visionary power to open the gates between the visible and invisible worlds, allowing passage to an ecstatic realm where miraculous physical and spiritual healings occur, love and enthusiasm for life are rekindled, the future divined, and the soul's purpose revealed. 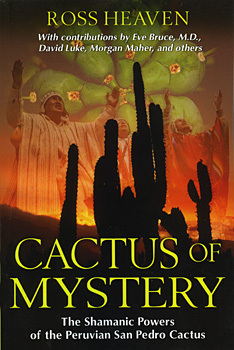 Exploring the history and shamanic uses of the San Pedro cactus, Ross Heaven interviews practicing San Pedro shamans about ancient and modern rituals, preparation of the visionary brew, experiences with the healing spirit of San Pedro, and their teachings on how the cactus works on the mind, body, and illness. He investigates the conditions treated by San Pedro as well as how it can enhance creativity, providing case studies from those who have been healed by the cactus and accounts from those who have been artistically and musically inspired through its use. Psychedelic researchers Eve Bruce, M.D., David Luke, Ph.D., and journalist Morgan Maher contribute chapters delving into San Pedro's effects on conscious evolution and psychic abilities as well as its similarities to and differences from ayahuasca. Exploring plant communication and the vital role of music in San Pedro ceremonies, Heaven explains how healing songs are communicated by the sacred plants to the shamans working with them, much in the same way that other gifts of San Pedro--from healing to inspiration to expanded consciousness--are passed to those who commune with this ancient plant teacher. "This is a simply splendid book! Ross Heaven has written and edited an insightful and information-filled volume including reports from several shamans who have worked for many years with San Pedro. We finally have a definitive book on this remarkable psychedelic plant. Thank you for opening so many doors, Ross Heaven." ROSS HEAVEN is a psychologist, healer, and workshop facilitator and presenter with extensive training in the shamanic, transpersonal, and psychospiritual traditions. The author of more than 10 books, including Plant Spirit Shamanism, he teaches workshops on shamanism and plant medicines in Spain and England and coordinates trips to Peru to work with indigenous plant shamans. He lives in Spain and the United Kingdom.